Washing machines have now become more of a necessity as no one have time to hand wash clothes. Also cleaning laundry by hands need almost the same amount of water as that of a machine. And such activities even stress out your body. So here we are with our 5 best top loading washing machine reviews. Today we are only focusing on top loading units as they are quite popular with some people. Even some users trust working of a top load washer more than that of a front loading washing machine. So we have 5 best products, especially for such buyers. Wash quality of a top loading washing machine is better than hands. And they are a lot cheaper than front loaders. Even you do not buy special costly detergents with a top loader. A regular detergent or liquid works fine with such units. Further, there are less issues of door leakage and mildew build-up with top loading washing machines. Whereas, front models are more prone to mold and mildew build-up. We’ll discuss the difference between front load and top load washing machine in buyers guide section. For now lets us begin with best top washing machine reviews of 2019. 6.2 2. 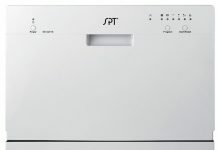 How to clean top loading washing machine? 6.3 3. How much water does a top load washing machine use? Simple controls of speed queen top loading washing machine TR3000WN makes it stand 1st on our review list. It comprises knobs and switches on a panel to select different modes easily. In addition, it comes with an agitator that helps to clean your laundry more thoroughly. And agitator eliminates the need to spot clean dirty collars or stains manually before throwing them into a washer. 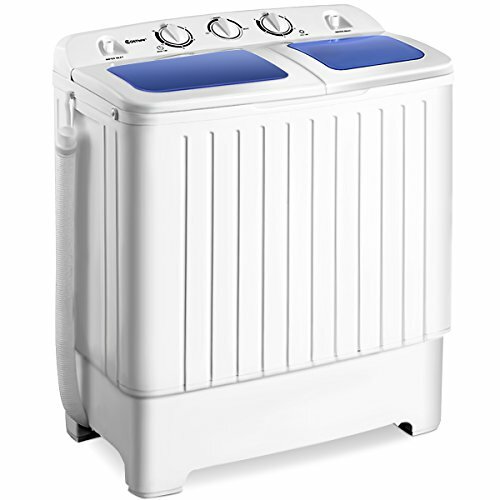 Talking about its capacity, this top loading washing machine with agitator offers 3.3 cu. ft. of load capacity. Therefore, you can easily fit 4 queen size sheets, multiple pillowcases and other laundry items. You get an option to select wash temperature from hot, warm and cold. However, the only option of rinse is by using cold water. But on the positive side, it draws hot water directly out the tap as well as does not dilute it with cold water. Also, a heavy-duty hot water cycle finishes in just 30 minutes. Furthermore, it provides an extra-rinse switch that helps with hard water. If your area gets hard water supply then simply turn on the extra-rinse switch or else simple rinse is fine. Thus, all features of the unit make it the best top loading washing machine with an agitator. If small space is your concern then you might love this portable top loading washing machine. 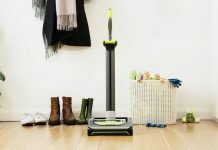 Its compact design easily fits in small apartments. But don’t let small size of the unit fool you with its efficiency. 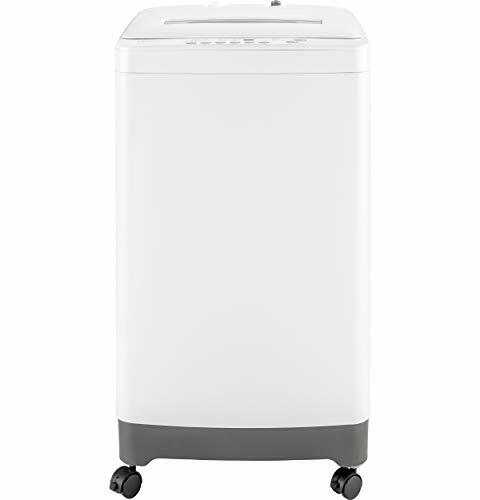 In spite of the compact size, this top loader can fit 2.1 cubic feet of laundry. This much capacity is good enough for small to medium size family. The absence of agitator helps in placing more number of clothes. Moreover, the weight of the unit is just 50 pounds which makes it easy to move around. 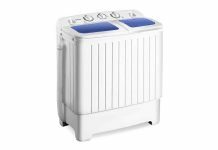 You can also read our review of the best portable washing machine. LED display lets you control 8 different wash cycles including dedicates, heavy duty, normal and speed wash. So yes you can wash a variety of laundry from soft wool to dirty shirts with this top loading washing machine. Furthermore, it comprises of a clear glass lid that allows you to monitor the ongoing process. Let us not forget to mention its adjustable feet. These adjustable feet improves the stability of such unit when placed in uneven surfaces. Plus, it comes with all necessary hoses and caster kit for hassle-free installation. Semi-automatic machines are best for people who likes to control each and every function of the unit. So we have an amazing product from giantex on our best top loading washing machine reviews. Powerful motor of the unit gives wash quality same as that of a fully automatic model. Also, it comprises of twin tub, one for washer and another tub for spin drying clothes. 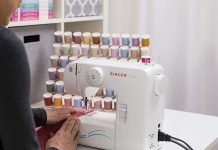 While it provides 10 lbs washer capacity, it takes up to 6 lbs load for spinning. In fact, you can run both washer and spinner at the time time to save time. Thus, making it best top loading semi automatic washing machine. Eco-friendly design of the product uses less detergent and water. So if you face water scarcity then this product might be beneficial. Also, 300 watts of power will not use much electricity. Even if you make use this top loader daily, it will cost you much less than laundromat. Unlike fully automatic models that need professional for installation, you can install this giantex unit all by yourself. But above all, less price of the product makes it the best top loading washing machine under 500. If high price of automatic units is stopping you from buying one then here comes a product that is both, less in price and fully automatic. Along with that, compact design of unit is perfect for small spaces such as apartments, dorms, condos, etc. Further, lightweight weight of this top loading washing machine allows you to carry it to camping. In spite of its small size it can hold up to 10 lbs of laundry. And this much capacity is enough to fit a light sweatshirt, 5 pair of tshirts and a jeans. 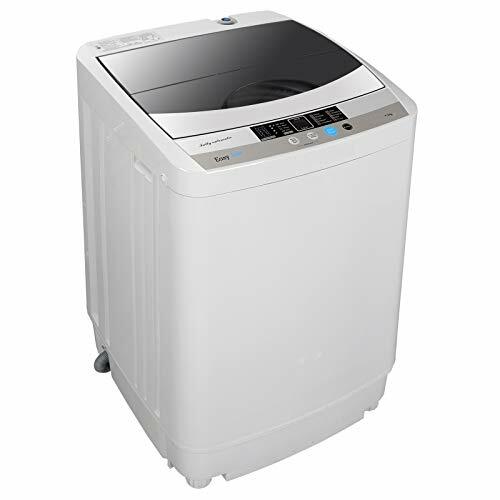 The zenstyle top loading washing machine offers 10 wash programs and 8 water levels. All the programs, operation and selections are clearly listed on control panel. Just select the most appropriate mode according to your laundry and leave rest of the work on machine. It will automatically draw water, wash the clothes and drain out dirty water without any manual interaction. In spite of offering such wonderful features it is a budget-friendly product. Therefore, it stands as one of the best top loading washing machine under $500. 4.1 cu. 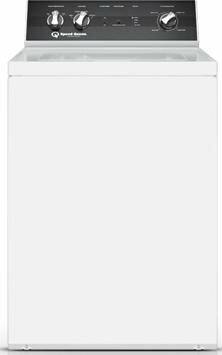 ft. capacity of this top loading washing machine is perfect for medium to large size families. With this much large capacity you can fit 9-10 printed t-shirts, 2-3 shirts and 2 pair of xl jeans at once. As agitator it quite rough on clothes, the unit provides with fabric softener dispenser. You can add a top load suitable softener to get a sparkling shine on clothes. 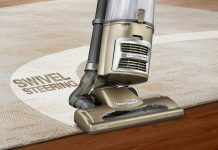 Moreover, it offers a total of 12 wash cycles for different types of cleaning. You can select the most appropriate mode according to the quality and quantity of laundry. Another interesting feature of this high-efficiency top loading washing machine is it offers 5 soil levels. Set the soil level according to dirt present on clothes for more effective cleaning. It simply increases cycle time in order to remove dirt along with the help of agitator. Furthermore, it offers 4 temperature settings to choose from. This is by far maximum temperature options offered by a unit for cleaning clothes. All of its features simply make it fall under the category of the best top loading washing machine with agitator. There are certainly some differences between front load and top load washing machine. That is what makes both of them unique. We have below short points to make difference between both the models clear(1). 2. How to clean top loading washing machine? Cleaning a top loading washing machine is no big deal. Also, you should clean it on a regular basis to avoid build-up of mold and mildew inside tub. Turn on the machine and select the hottest temperature and highest water level. In case, you do not have an option for hot water, simply select the highest water level. Once the tub is full of water, add vinegar and baking soda. You can replace baking soda with 2 cups of lemon juice if you wish. All these ingredients are effective in removing hard water deposit, dirt, and grime. Then after, select only wash mode and let the baking soda completely dissolve into water. Once it gets dissolved, pause the function and let the solution remain inside the tub for half an hour. Now start your top loading washing machine again and complete the cycle. Drain out the mixture and fill the tub again with hot water. But this time simply turn on wash mode without adding anything. Doing this will remove the smell of soda and vinegar from it as well as take away loose grime. However, you can skip filling tub with hot water second time and make use of tissues instead. Just wet tissues with hot water and wipe walls of tub. Doing so will also remove dirt and lose grime from inside. 3. 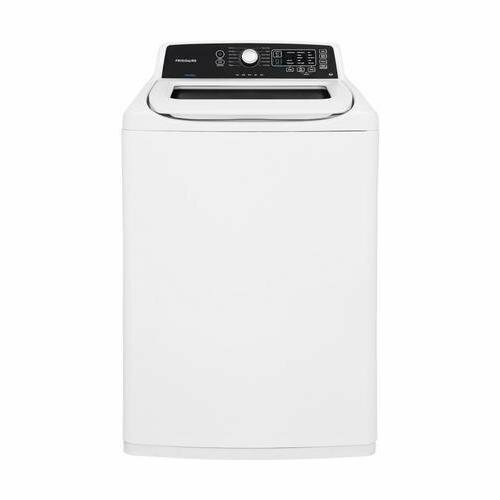 How much water does a top load washing machine use? A conventional top loading washing machine will use near about 40-45 gallon of water per load. However, it draws less water on selecting modes such as quick, delicate, etc. Our goal is to help as many people as we can to make them smart buyer. Informed buyers tend to get better deal. We Send Individual Product Reviews To Our Newsletter Subscribers. So make sure to follow us on social media and subscribe to our weekly mailing list. 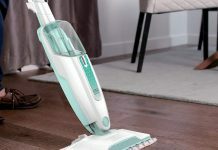 Home Stuff Pro is a participant in the Amazon Services LLC Associates Program, an affiliate advertising program designed to provide a means for sites to earn advertising fees by advertising and linking to amazon.com, amazon.co.uk, amazon.ca and any other website that may be affiliated with Amazon Service LLC Associates Program.